Minimum order is 25 coolies. Pricing as low as $0.76 each. Our prices include Setup and Shipping! The tall boy can cozys will accommodate all those new 16 oz cans. 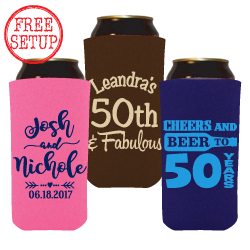 Made from Premium 1/8" Thick Scuba foam material and allowing both sides and bottom imprint area you can dress up your cans, keep your hands dry and your drink cold. 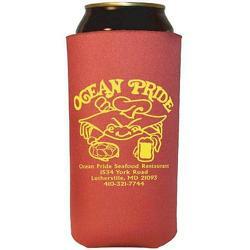 These really tall can coolies also provide you with a large imprint area to print your message, logo or quote.